Mucklow’s Fine Jewelry has been recognized for the second time by peers across the jewelry industry as a Top 50 Designer Retailer. The award was presented to Mucklow’s Fine Jewelry during JCK Las Vegas, the leading jewelry industry event attended by more than 23,000 retail stores and exhibitors from around the world. 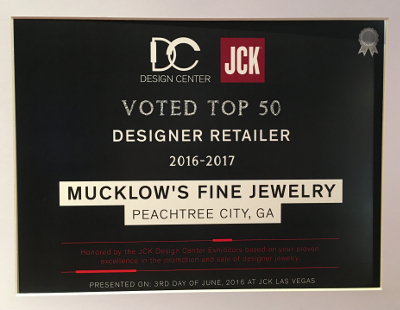 Mucklow’s Fine Jewelry is one of the few jewelers in Georgia to receive the Top 50 Designer Retailer recognition from JCK Las Vegas. The Top 50 recognition is determined by jewelry designers attending JCK who are asked to identify their top five retailers for standards of excellence in the promotion and sales of designer jewelry. 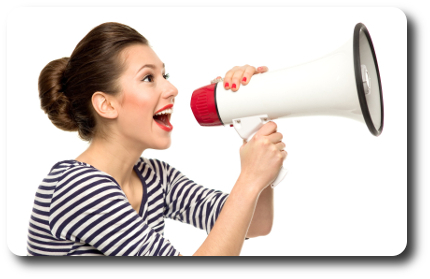 The number of votes each retailer receives determines if the retailer falls within the Top 50. 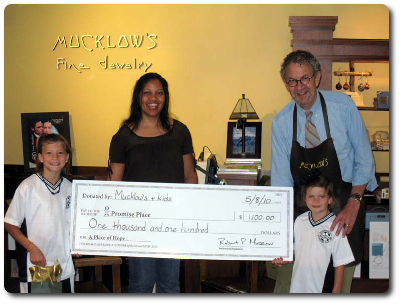 About Mucklow’s Fine Jewelry – Founded by Robert Mucklow over 20 years ago, Mucklow’s Fine Jewelry has a vibrant history steeped in innovative and captivating fashion jewelry design. Of particular note is the “Remembrance Bracelet”, which after being shown on the Oprah Winfrey show, became a success and sold in hundreds of locations nationwide. 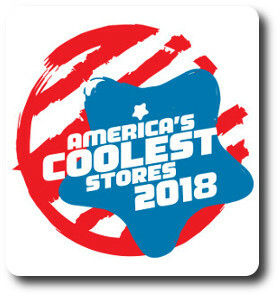 The unique Frank Lloyd Wright inspired craftsman style store location at 1103 Crosstown Court, Peachtree City GA, is the exclusive retailer for many fine jewelry and watch designers. About JCK Las Vegas – JCK Las Vegas is the leading jewelry event in North America open to all jewelry professionals, offering exclusive buying, networking, and educational opportunities. Each year 23,000+ retail stores and 2,300+ exhibitors from around the globe gather at Mandalay Bay Resort & Casino for the jewelry industry’s most extraordinary event. JCK Las Vegas combines a plethora of networking events and complimentary education sessions with the industry’s broadest selection of finished jewelry, gems and timepieces.